Peter Gill’s book looks at the controversial outcomes of the international efforts to help this historically powerful African country overcome the devastating effects of a series of droughts that destroyed the livelihoods of the people of Ethiopia. It focuses on the period since Bob Geldof’s Live Aid concerts gave massive publicity to the 1984 famine around the world. Gill documents the strained relationships between Ethiopian governments and Aid organisations, both NGOs like Oxfam and Save the Children Fund; and the global institutions such as the IMF and the World Bank. Making Poverty History’s achievement (or not) twenty years on is examined through Gill’s interviews with today’s Prime Minister, Meles Zenawi. Ethiopians bear witness to the changes which have, to varying extents, improved their lives in this period. Gill’s approach provides insights about the effect on Ethiopians of being seen as icons of poverty and under-development. There is a delicate balance between helping people become more self-sufficient through empowerment, and imposing the paradigm of free-market economics on them: at one point charities are described as “foot-soldiers of neo-liberalism”! The narrative is divided into historical periods. The political and economic changes leading up to the 1984 famine and since. It takes us through the final period of Emperor Haile Selassie’s reign, when he was overthrown partly as a result of his failure to respond effectively to the 1973 famine (that Jonathan Dimbleby first made public) or admit that his people were in serious trouble. Then there was the 17-year period when the military regime, Mengistu Haile Mariam’s regime was in power, with much backing from the Soviet block. The Derg military junta forced the resettlement of victims of famine from the North to the South. It also bombed the Northern territories to stop the Eritrean independence movement, the Eritrean Peoples Liberation Front, using food aid to feed the soldiers and prolonging the conflict. The book finishes with the present regime, headed by a former guerrilla fighter from the Eritrean and Tigrayan independence movement, Meles Zenawi, who has become increasingly autocratic since being in power. But since the author needed his approval to conduct his research, the narrative is rather biased in Zenawi’s favour. Gill goes out of his way to demonstrate how much more sensitive his resettlement programme was and serious his attempts to improve the agricultural and educational infrastructure. 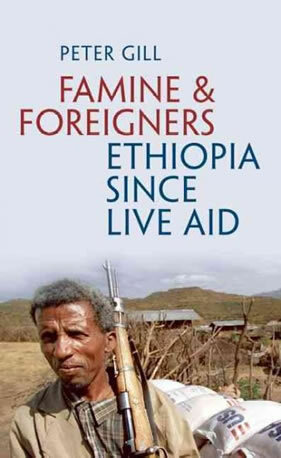 None of Ethiopia’s leaders have had good relationships with Western aid organisations, which they view as neo-colonialist, especially as Ethiopia remains proud never to have been a colony in the past. It has not been keen to give in to corporate power with its programme of land privatisation and aid ‘conditionalities’ that forbid the building of clinics and schools, required by the IMF. After the massive financial input through NGOs in the wake of the Live Aid events, NGOs counted for 25% of the national income. Oxfam as well as Save the Children Fund became more like corporations. Indeed, under Tony Blair, Oxfam became so close to New Labour, it lost any political independence, and became a ‘service provider’ rather than a force for empowering poor people. Medecins sans Frontiers remained more radical and criticised Oxfam for this, but even they had a hard time staying on the right side of Meles, who as a scholar wrote a thesis on the Developmental State, with the conclusion that while development could lead to democracy, the latter can get in the way of the former! Zenawi is perhaps the most powerful leader in Africa, representing the continent at both the G8 in Gleneagles in 2005 and the G20 in 2008. Now that Western finance has been withdrawn from his country, he has turned to China for investment in the roads and other basic infrastructure of a modern state, and bearing in mind the role of the ‘Dragon’ in Sudan, one has to be sceptical about their motivation in Ethiopia. It could be viewed as a poisoned chalice. The book is full of useful facts and poses important questions about the role of charity in the world which is increasingly dependent on help at times of crises caused by anthropogenic climate change. It may not have all the answers, but is worth the considerable effort of reading at least twice!